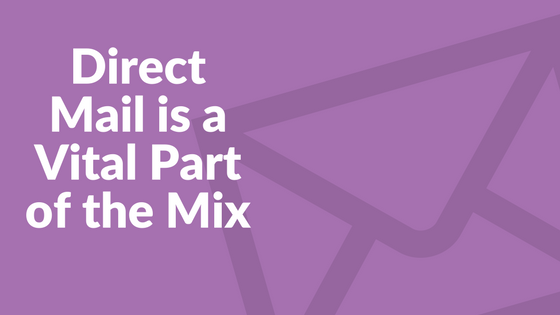 If direct mail marketing isn’t in your promotional mix, add it. Not long ago, brands turned away from direct mail marketing. It was expensive and there was stiff competition for reader attention in mailboxes that were overflowing with “junk mail.” On top of that, emerging digital channels offered a less-expensive way to reach large numbers of customers easily. Now, the tables have turned. Marketers aren’t blindly accepting the effectiveness of digital channels anymore. Digital is full of competing messages and swarming with fraudulent bot activity. So, where can brands get attention today? In the mailbox. According to 2017 Media Usage Survey results, although down from its peak years ago, direct mail marketing is growing. Thirty-one percent of marketers surveyed reported increasing their use of direct mail last year. Another 33 percent kept it at 2016 rates. In 2016, brands spent $46 billion on direct mail marketing, according to the Winterberry Group. Companies are returning to direct mail marketing because it works. A recent Data & Marketing Association Response Rate Report shows the response rate for direct mail is 3.7%. The response rate for all digital channels combined is less than 0.75%. Direct mail marketing is effective because it combines the targeting potential of a channel such as email with the emotional power of advertising. Recent studies have demonstrated that consumers are reading direct mail more and more. Almost 80% of consumers will act on direct mail immediately. Only 45% do it with email. The fact is, high-quality print pieces get brand attention. Nowadays, print gives you a competitive edge. The marketing holy grail of omnichannel campaigns, where all channels work in concert to target the same version of a customer, must include direct mail. Direct mail is fantastic for reaching customers early in the buyer’s journey, when you can make attention-getting, personalized connections. According to Andrew Paparozzi, chief economist with Idealliance, the future of marketing lies in personalized, integrated communications where direct mail complements digital experiences. Studies by the U.S. Postal service have demonstrated that when direct mail is used as part of an integrated campaign, it boosts brands’ ROI by 20 percent and helps improve the lift of online campaigns by 62 percent. That seems like good reason to make sure direct mail marketing is part of your mix going forward.